Sometimes things go wrong. They just don't work. For me, it was when someone complained that their emails weren't getting through to a mailbox, from a specific client. The basic premise is this: There are 2 debug parameters that will be useful. SMTPDebug - This parameter can be set to enable the capture of inbound SMTP protocol conversations. This is for all messages received by the SMTP listener from all clients and servers via the SMTP protocol. 2. Enable information logging of data sent and received along with some additional debugging information. This setting indicates commands and responses being received/sent along with the number of bytes being transmitted, but does not include the text that is transmitted. 3. Enable verbose logging of data sent and received. 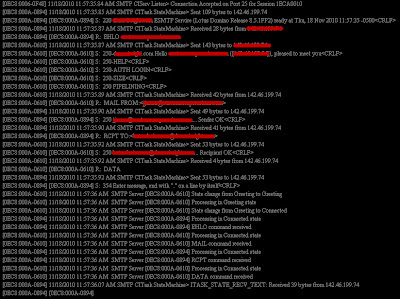 Along with the information recorded at setting 2, this level shows the actual text received/sent via SMTP. Note that this does not include the text body of messages. 4. This is the most verbose you will get for logging (note that this is an undocumented value -- the documentation only lists up to 3, which is strange, as it is documented on the IBM support site...). I, of course, jumped right to option 4. SMTPDebugIO - Enables the logging of all data received by the SMTP listener task. 2. There is no number 2. Again, I went for option 4.